An internationally recognized vacation destination, Naples has quickly become the definition of luxury living at its best on Florida’s Gulf Coast. The luxury lifestyle, varied culture and environmentally conscious attitudes here have molded the Collier County area into one of the most attractive locations for real estate opportunities. Some of the most luxurious golf course communities in the area call Naples home. With close proximity to I-75, the vibrant Naples downtown area offers a mecca of sophisticated shopping, fine dining and cultural and entertainment choices. The outdoors has never looked so enticing with boating and fishing in the Gulf and canoeing in the unspoiled playground of the Everglades. Stroll seven miles of white, sandy Gulf Coast beaches and take a dip in the crystal waters offshore. A plentiful selection of quality schools and medical facilities are conveniently located for Naples’ residents. From vacation homes to permanent homes, this is the prime location for real estate opportunities with the finest builders and developers in South Florida creating golf and custom estate homes in the most luxurious gated communities. Step outside your door and experience Naples’ refined yet exciting way of life. Shining brightly in the mid-day sun from its vantage point poised on a gentle, wooded rise, The Club is a beacon of beauty and warmth. Understated elegance and welcoming charm embrace you within its walls while peaceful panoramic views of the lush green fairways and sparkling lakes surround you. The 62,000-square-foot Club offers a spacious yet charming atmosphere. The Club is the ideal centerpiece to the membership experience at Grey Oaks. 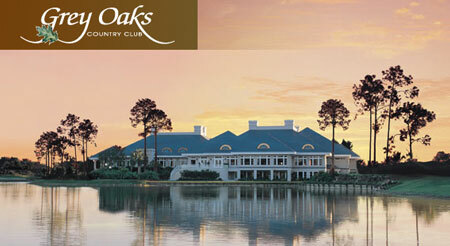 Grey Oaks members also enjoy the added comfort and convenience of the new Estuary Clubhouse and golf course. This refined venue is truly a home away from home, where you can relax with friends and neighbors, unwind after a golf game, and enjoy casual and al fresco dining, all while enjoying sweeping views of the Bob Cupp signature designed Estuary golf course. The Club at Grey Oaks is a unique destination on life's journey. A gracious porte cochere and stately grand entrance gallery welcome each guest to an inviting blend of elegance, congeniality, and superb service from a personable, caring staff. Colorful original artwork and comfortable traditional decor harmonize to create an impressive 62,000-square-foot social center that is warm, open and friendly. From its naturally wooded, elevated site, members enjoy glorious panoramic views of the Pine Course and lakes that surround the formal dining room, lounge, and outdoor overlook. Grey Oaks members also enjoy the added comfort and convenience of the Estuary Clubhouse and of impeccably appointed space, the Clubhouse also includes a fully stocked pro shop and his and hers locker and card rooms. The Estuary Clubhouse's secluded location ensures exclusivity and gated privacy for all Grey Oaks Country Club members.